Morphing layers simplify the morphing animation. Complex shapes are often too difficult to control and may not work properly, by dividing the drawings into morphing layers, the task becomes much easier. 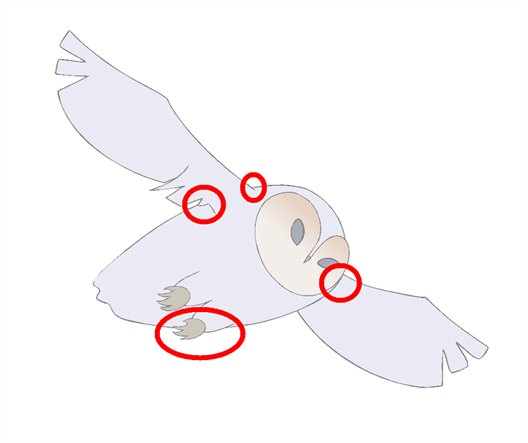 An important aspect of morphing is to identify possible problem zones in order to fix them and avoid potentially frustrating situations. Simple details that look easy to morph can sometimes be more challenging than they may initially appear to be. For example, you may find that the nose becomes an issue when performing a head rotation. As explained earlier, the drawings need to be similar in their number of shapes. Generally, on a head rotation, the source nose is in the centre of the face, but on the destination, the nose line is part of the face outline. This means that on the source drawing, the nose and the face outline are two separate shapes, whereas they are combined into one shape on the destination drawing. 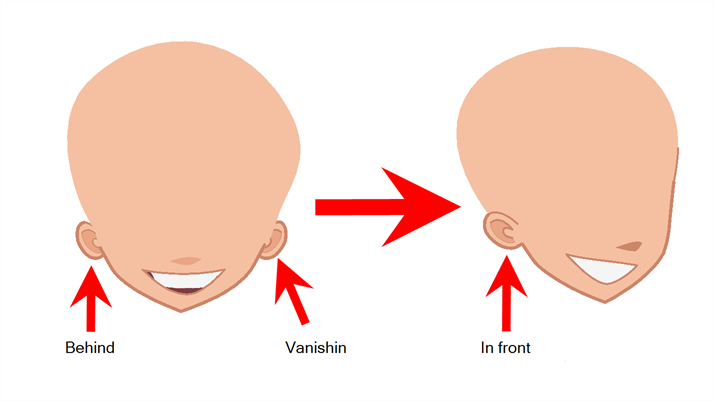 Morphing a full face as demonstrated on the figure below will cause the source nose to slowly vanish as the destination nose grows from the character's cheek. Any shape that is contained inside another one and has to morph out of that shape will be problematic for the same reasons as the nose is. At some point during the morphing sequence, the shape contained inside the face will merge with the face outline, and then become a separate shape again. Morphing layers are all contained in the same drawing layer. It is like having a mini Timeline within a Timeline layer, or a mini Xsheet within an Xsheet column. Each morphing layer can have its own duration and velocity. Also, because you only have a single element to handle in your Timeline or Xsheet view, it will be treated as one element for the Compositing process, making the compositor's work easier. You can separate all of your elements into different drawing elements and have many layers, but you would have to create a large number of morphing sequences and make sure that you modify all of their timings properly. 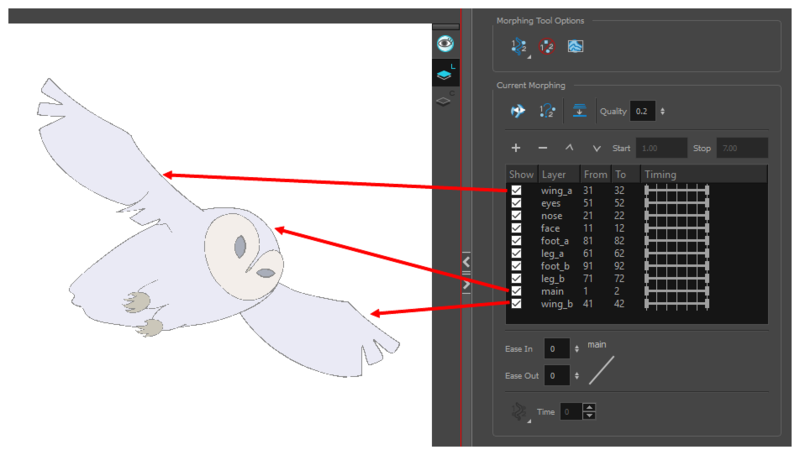 Both solutions are correct, but morphing layers makes it easier to handle and does not change the scene structure by adding more elements, which can be very important for Cut-out animation puppets. For example, if you morph a front head to a three-quarter head where the ear needs to be separate, you do not want to add a new ear layer at the same time and have to worry about connecting it inside the puppet's construction. Instead, simply create an ear morphing layer within the head layer. NOTEUse a naming convention for each morphing layer such as ear_1, ear_2 or head_1, head_2. You can also use the numbers 1 to 9 for the first layer, 10 to 19 for the second one, 20 to 29 for the third one and so one. This technique is useful if you plan to do more than one morphing sequence in the same column. For example, front head to three-quarter head to side head. The three-quarter drawings will be used in both morphing sequences.